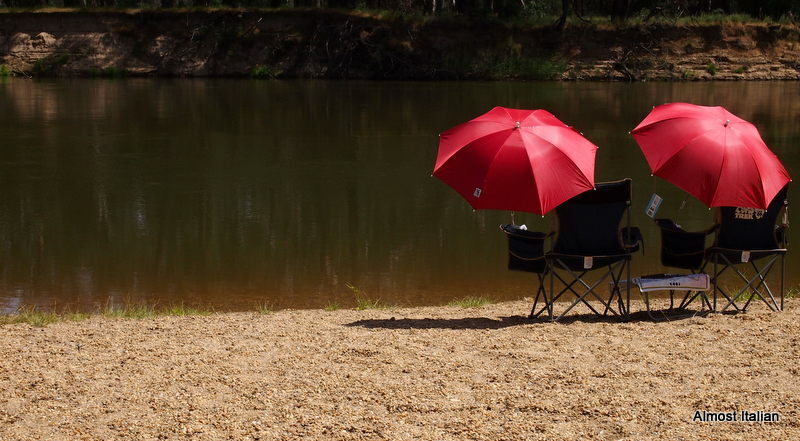 Sitting on the banks of the ancient Murray River, the day is hot and still: I pass the afternoon with a glass of vodka and Passiona on ice, sunning my legs, followed by a dip in the water, while chatting with my daughter/best friend. Oh Happy Day. 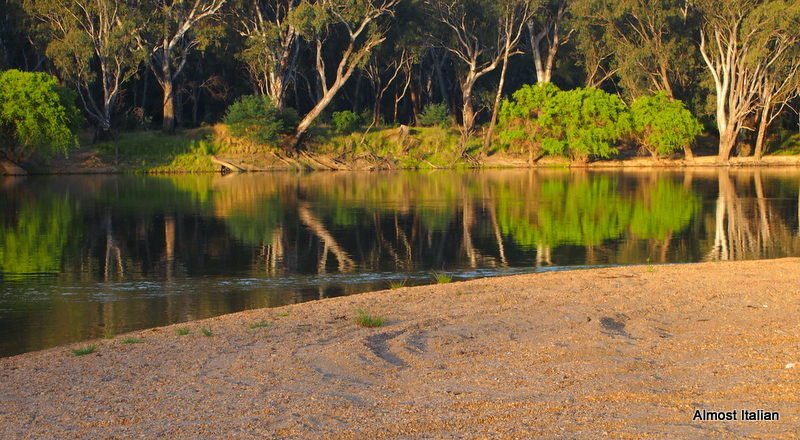 I’m on a mission to explore the many beaches and banks of the Murray River, camping off the grid where possible. 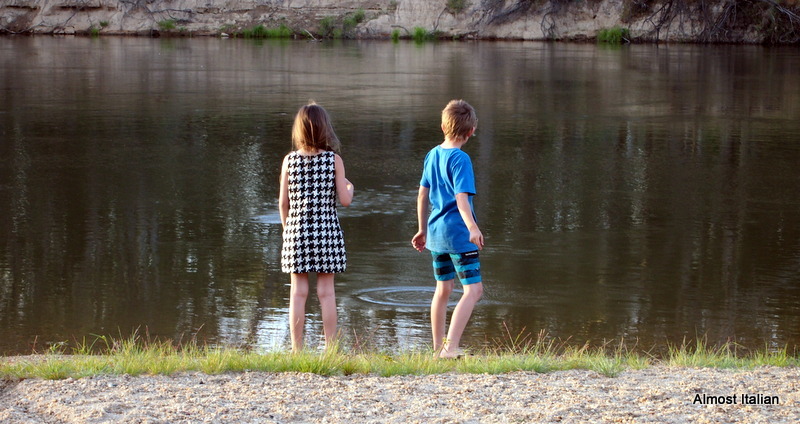 As the river is 2,508 kilometres in length and runs through three states of Australia, this could be mission impossible. Earlier Murray river posts can be viewed here and here. 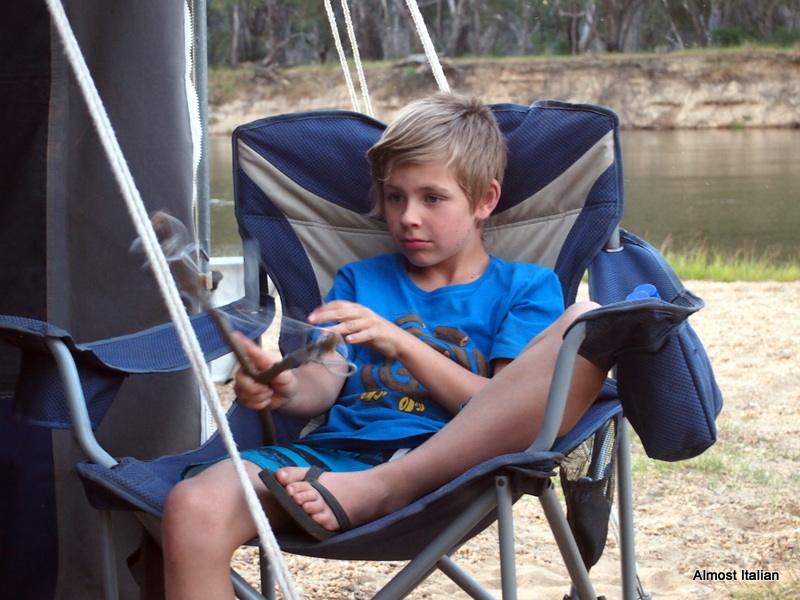 This time, we set up camp on a sandy bank between Cobram and Yarrawonga in Victoria, one day after a holiday weekend. We had this glorious beach to ourselves, bar two canoeists heading down stream, and one tourist passenger boat. I’m glad I wasn’t perched on the throne of my river view toilet/shower on that occasion. Thanks to Kyle, who should be cloned and packed away in everyone’s tool box, we had hot water on demand, many other unusual and handy camping gadgets, as well as ready help with anything to fix or adjust. His gadgets included a vacuum cleaner, a high pressure hose, an electric fan, radios, mobile phones, tablets and iPads, shower pumps and portable fridges, to name just a few. Solar panels supplied power to the 12 volt battery systems that had already been charged by our vehicles in the trip to the river. An inverter took care of converting 12 volt power from the batteries to 240 volts for those appliances that required mains power. Our hot water service was fired up each morning and evening. 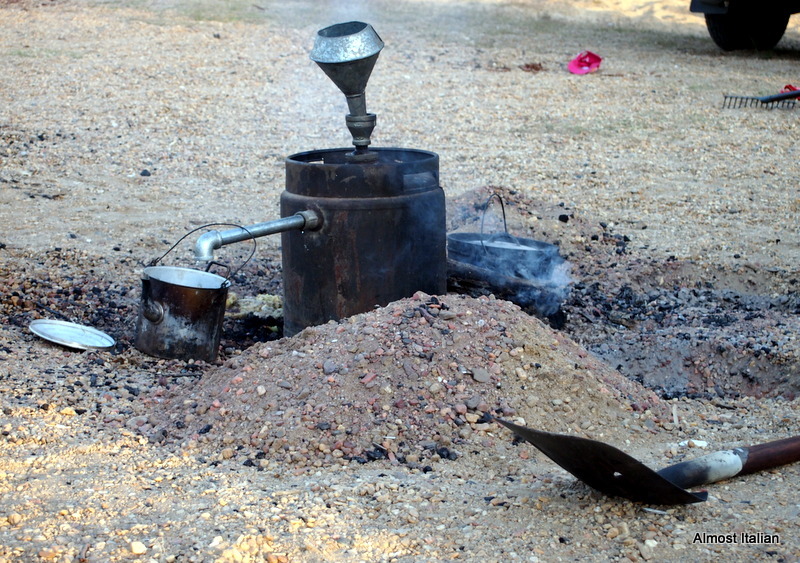 Cold river water is poured into a funnel inserted in the top of the keg which is then heated on the campfire. A short time later, boiling hot water comes from the outlet, providing enough for showers and dishwashing. Kyle’s repurposed stainless steel beer keg hot water service. 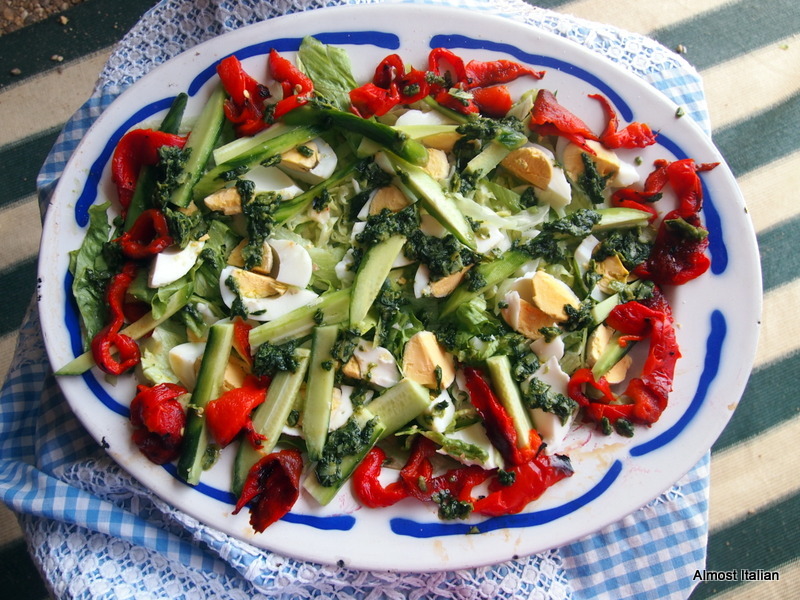 Camping trips require good but simple food. Sometimes we cooked on gas or used Kyle’s Dutch ovens, partly buried in a shallow layer of hot coals with more hot coal on the lids enabling roasting, casseroling and baking. Lunchtime catering on hot days consisted of sandwiches and salads: the kids picked out the bits they liked. The pescatarians ate stuffed peppers with leftover Pesto Mac ( a variation of Mac and Cheese for pesto lovers) as well as curries and salmon burgers. The family took the week off, cashing in on Melbourne Cup Day Holiday to take time out in a great month of the year. What did the kids learn? The oldest (10) learnt about solar energy and sustainability and the basic law of physics, via the water heater service. He observed our camping solar panels in action and asked the pertinent question, “If this is the sunniest spot in Victoria, why aren’t there more solar panels around? This area could produce enough power for the state of Victoria!” Good question Noah. 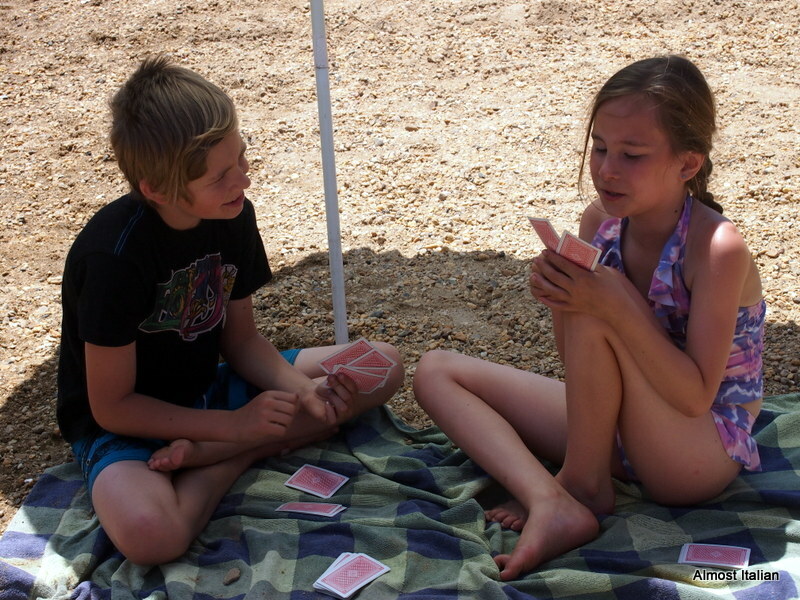 A child can see the common sense in solar energy after a camping trip like this. Are our political leaders slow learners, are their heads buried in the sand or inserted into another orifice of the dirty brown coal industry providers? At 10 years old, kids ask questions, at 18 they vote. At 50 what will their world be like without a radical change to address climate change? 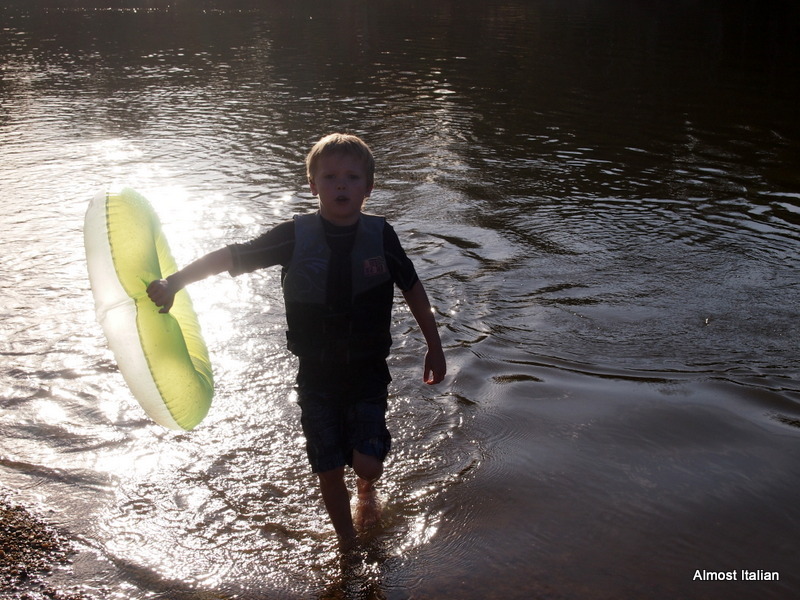 The younger ones learnt to use the currents of the river to move downstream (with safety jackets on). 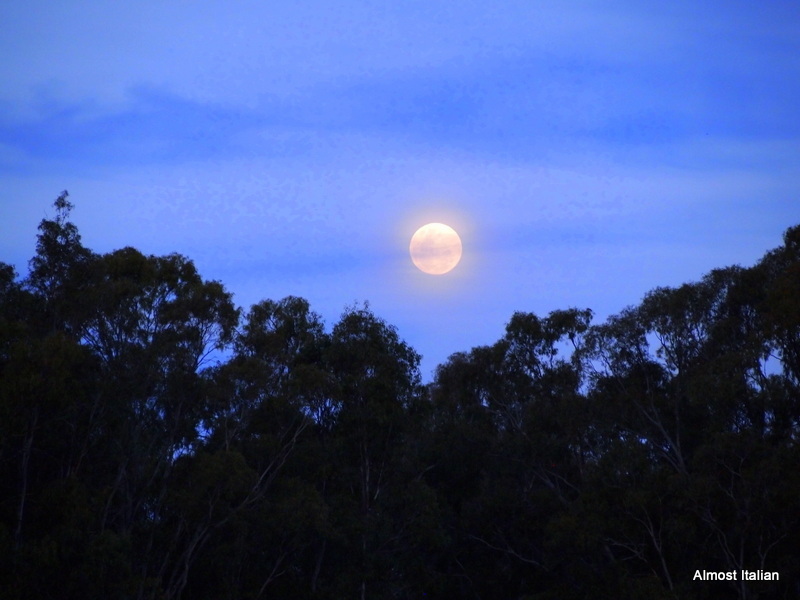 They watched the full moon rise each evening. The girls found some instant $1.00 fashion in the op shops of a nearby town. The children had no need for shoes, they were always hungry, and they played and looked after each other. The cards came out, Ollie found a handmade sling shot, Lottie found an off cut of redgum wood which became an oiled cheese board. They skip jumped rocks on the river and dug vast holes in the sand and joined in night-time campfire conversations about dreams. We wound up with a moonlight ballet concert on the beach, spot lit by one of Kyle’s camping toys, with Daisy doing a great dying swan act on the banks of the river. 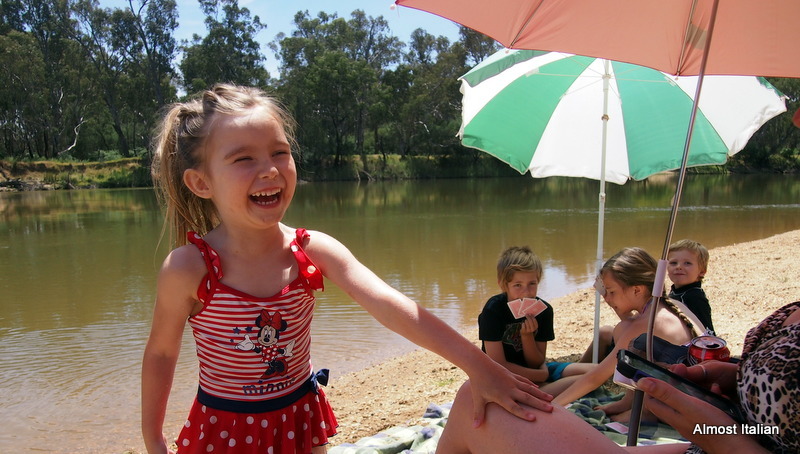 How nice it would be to take a tinny or kayak down the river from Yarrawonga to Cobram. Take Me to the River, Al Green, nicely covered by Talking Heads. I See the Bad Moon Rising, Creedence Clearwater Revival. Swan Lake, Tchaikovsky -you know the one! Oh Happy Day, 18th century gospel song first popularised by Edwin Hawkins Singers in 1969. Love is a Battlefield, Pat Benatar, a good tune to dance to in the wilds.